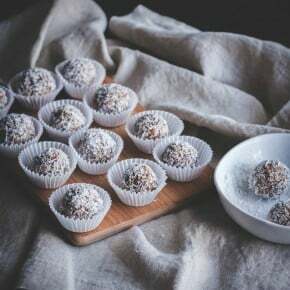 Are you looking for healthy snack recipes? 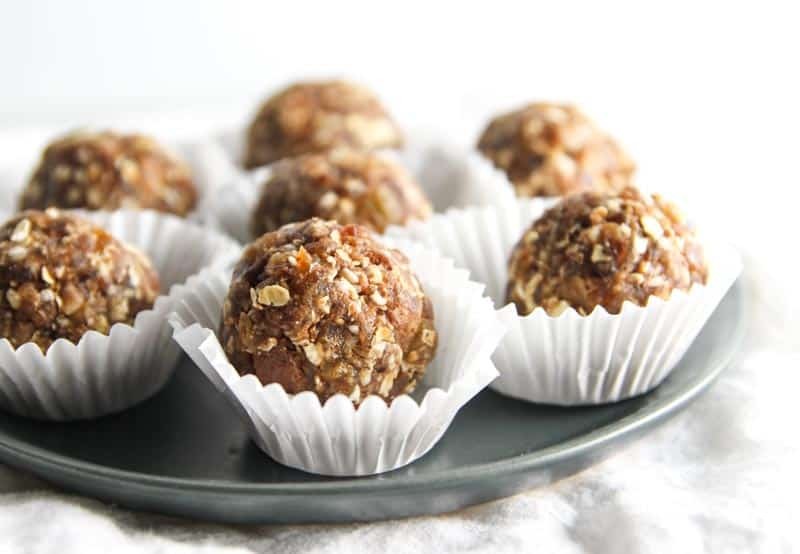 I know I always am, and as soon as I made these no bake oatmeal cookie energy bites (which just so happen to be sugar free, gluten free, and vegan) I knew I had found my go-to snack recipe for the new year! The reality is sinking in, it’s 2016! I love thinking about all the possibilities and goals for the year ahead. One thing I really want to focus on this year is eating more mindfully, and one of the things that helps me do that is having healthy snacks around. If I don’t have any healthy snacks on hand, chances are I’m going to eat something not-so-good-for-me. As I’m shopping at Trader Joe’s for some healthy snacks I see dates on sale…for $2.99!! Normally these same dates sell for $10-15 so I grabbed some right away! I mean $2.99, you can’t go wrong, right? That’s the cost of one fancy granola bar, I was so excited I immediately shared my find on Snapchat (I’m username: Sweetphi) and got back several replies of people who went out to get them that same day and also found them at the sale price…so fingers crossed they stay that price? 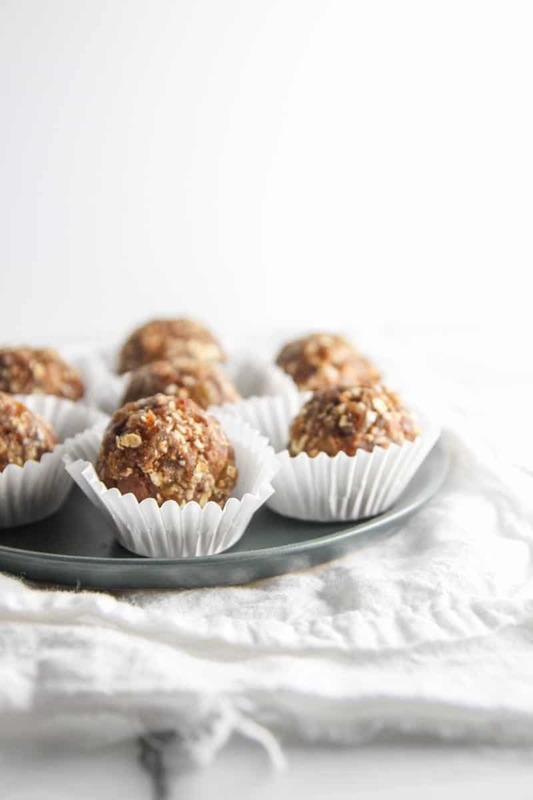 These no bake are perfect for bring to work and keeping on hand for when you need a healthy snack! Right around 2 pm when I need a little snack, instead of eating an unhealthy cookie I have been having one of these and have been loving it- the bites provide natural energy and totally helps with the afternoon energy slump. In a food processor, process dates and tablespoon of water for 5 seconds. 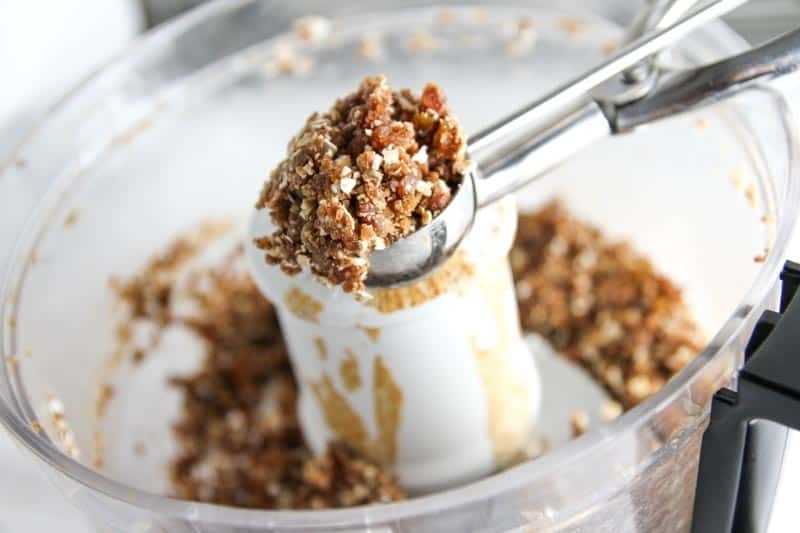 Add almond butter, raisins, oats and cinnamon into the food processor and process for 5-10 seconds, until the mixture comes together, it should be sticky to touch and easily form a ball. If the mixture does not stick together when pressed between two fingers add a few more drops of water. 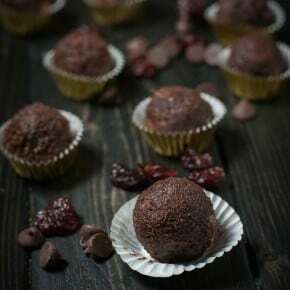 Using a 1 tablespoon cookie scoop or a tablespoon, scoop 1 tablespoon of mixture into your hand and roll it into a ball shape. Place in a mini muffin liner or in an air tight container. Refrigerate for 1 hour and then enjoy or keep stored in the refrigerator. 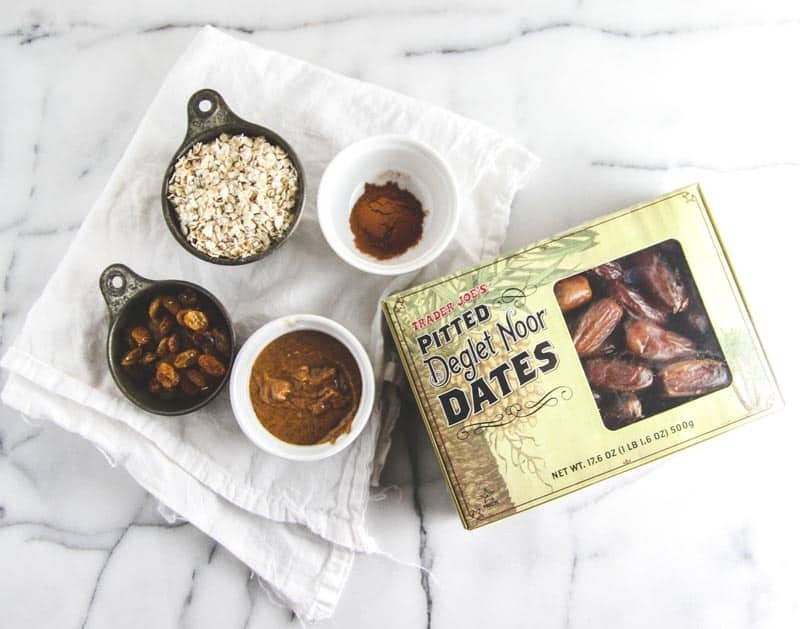 You can use medjool dates or any other kind of dates you'd like. You can use peanut butter instead of almond butter. You can use any kind of raisins you'd like (I used yellow raisins). Disclaimer: some of the above links are affiliate links, if you purchase amazon products through my store at no cost to you, I will earn a few pennies. As always, thank you for supporting the brands and products I love that make the Sweetphi blog possible. An excellent, yummy and healthy snack! Kudos Phi, another great recipe! Thank you! Have an amazing weekend ahead! These little bites have been my healthy snack for the past week and a half, they’re just SO good! Don’t you love that everything is SO much cheaper at TJ’s?! It’s the best 🙂 these bites look like the perfect pre- or post- workout snack. Anddd now I need to go see if they are still on sale! That is crazy cheap! These little bites sound perfect! And gorgeous photos too! Isn’t it SO cheap? I too did a double take when I saw dates for that price. They were totally worth it, as I’ve made these little bites more than once already. And thank you so much for the compliment about the photography-much appreciated! These sounds really yummy! And I love that they are healthy, too! Lately I’m all about snacks that are delicious and at the same time healthy, and these definitely fit the bill, you’d love them!! These look really delicious. At work one needs bite sized portions for snaking seem to be just the go to snack with plenty of fiber also. Thank you for such a great recipe. You’re absolutely at right, a one bit sized portion for snacking is perfect for work, I make a batch of these and I’m set for snacks for the week. Thank you so much for your comment. Totally wish there was a TJs near me! 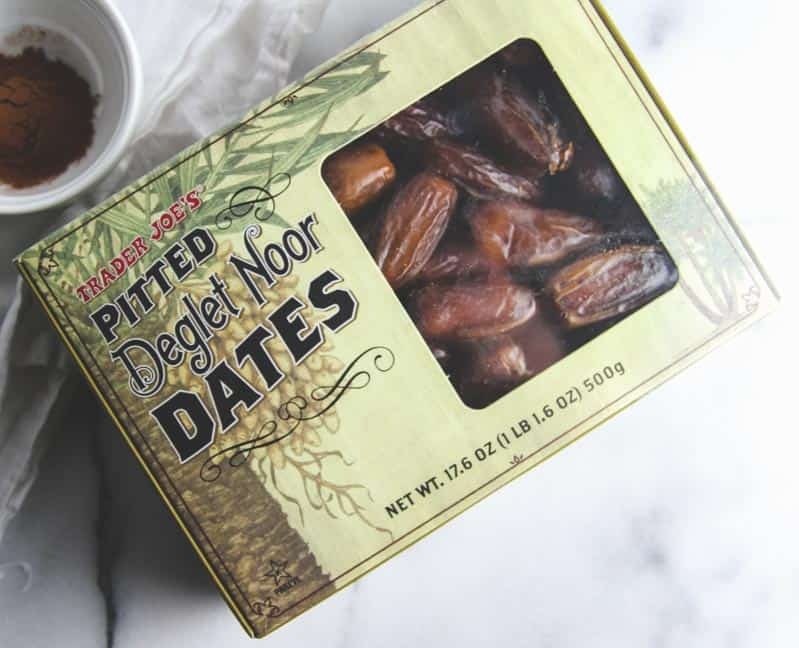 Guess I am going to have to pay an arm and a leg for dates, because I NEED these energy bites in my life! Oatmeal cookies are one of my favorite cookies, so turned into a healthy bite of deliciousness is perfection! Pinned! Cheers! I find them so difficult to photograph though, so well done as these look great. 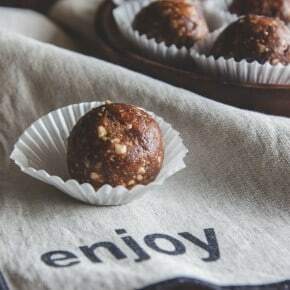 I love having this type of energy bites in the fridge and grab a couple after a workout. These ones look delicious plus oats have so many health benefits! Thank you so much for commenting – these are definitely perfect for a quick snack to have on hand! This sounds like a great recipe. I’m going to make them this weekend, so I can throw a few in my lunches next week. Thanks!!!! I hope you love these as much as we do – they’re great for snacks/lunches all week long!